Soft4Boost PC Win Booster Free (formerly Soft4Boost Disk Cleaner) is a disk utility tool that has been designed to help you keep your hard disk clean and uncluttered by removing any unnecessary or obsolete folders and files. Unnecessary, or junk files, appear as a result of incomplete uninstalls, temporary Internet files, and recycle bin files. Soft4Boost PC Win Booster Free helps you quickly wipe out all these junk files. It also finds any duplicate files that may be on your system, such as identical pictures, and documents. The duplicate file finder works by comparing files by names and content, so, it can provide you with a more thorough search. PC Win Booster Free deals with all the areas that stand the risk of cluttering your computer, namely temporary Internet files, empty folders, junk data, broken shortcuts, the Recycle Bin and browser toolbars. You can make a selection of the system sections that you consider in need of a cleanup, although it is recommended that you perform the operation for all of them, at least once. Also, another almost compulsory precaution is a backup of the registry, to have as a recovery solution if something goes wrong. The program quickly scans common computer areas and comes up with a full report of the errors identified during it. Moreover, you have the possibility to manually select the files to be deleted during the fix-up stage. There’s no harm in running the utilities twice, in order to be sure that nothing toxic resides on your system anymore. In addition to the cleaning module, you will also benefit from a program uninstaller that serves to remove programs that are installed on the computer, as well as a duplicate file finder that quickly spots dupe content and deletes it with the purpose of regaining valuable space. 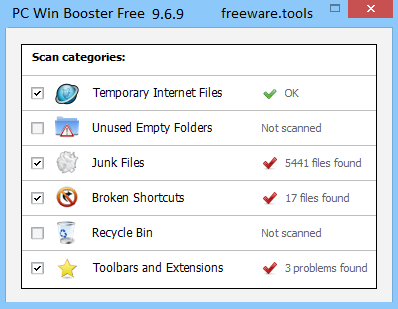 PC Win Booster Free makes it possible for you to quickly clean up your PC, also providing tools for uninstalling applications and getting rid of duplicate files that occupy storage space.